A variety of instrument modifications that aid in dissection of the adrenal gland have been described. The harmonic scalpel may be of particular use in reducing operative time (58,78). Laparoscopic ultrasound probes with frequencies in the order of 5 to 7.5 MHz may be useful in identifying the adrenal gland and vein, confirming the presence or absence of an abnormality on the affected and contralateral sides, determining the resectability of large masses, facilitating partial resection, and identifying pathology in adjacent organs (6,64-66). However, data pertaining to the usefulness of this modality has been conflicting. Lucas et al. found laparoscopic ultrasound particularly useful in identifying the adrenal vein on the left when it is obscured by large amounts of retroperitoneal fat (66); in contrast, Brunt et al. 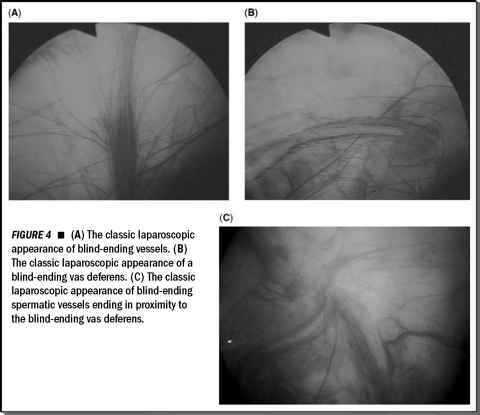 found that laparoscopic ultrasound identified the vein in only 21% of cases (65). Laparoscopic ultrasound may be of particular benefit in retroperitoneal approaches where the landmarks may not be as readily apparent and the adrenal is more difficult to identify. This modality has also been used to localize extra-adrenal pheochromocytoma (83). Ultrasonic aspirator systems have been used to aid in the dissection of the inferior vena cava and renal hilum to dissect the adrenal from the surrounding fat (84). Suzuki et al. found that the operative time was shorter and blood loss less with its use (84), whereas conversely, Takeda et al. found no differences in these parameters (85). On the left side, the tail of the pancreas may be confused with the adrenal, but it lacks the characteristic color of the adrenal. If it does not look like the adrenal, it is probably not the adrenal! In our experience of retroperitoneoscopy for pyeloplasty and nephrectomy, we have found that when this space is first developed with the index finger, it is important not to sweep the finger anteriorly because this can tear the peritoneum. The argon beam coagulator has been described as useful for some right-sided lesions with attachments to the liver (85). Atraumatic suction graspers have been associated with shorter operative times and aim to facilitate gentle handling of the adrenal, allowing better exposure of the vessels by enabling retraction of the gland (86). Obermeyer et al. described administering intravenous methylene blue in five mini-Hanford pigs to aid in adrenal identification (87).